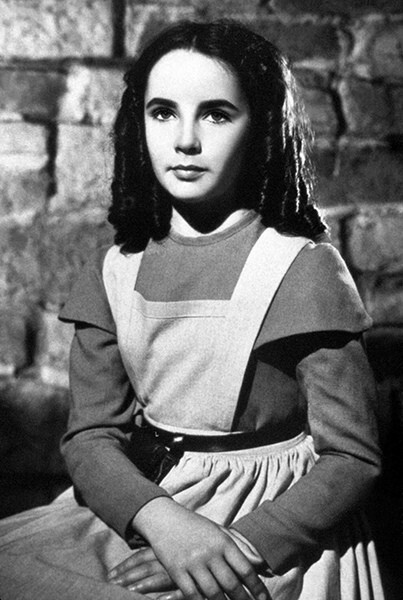 She was one of the last “old-school” movie stars, raised in the Hollywood studio system, Elizabeth Taylor was a popular child actor and matured into the grand dame of film. 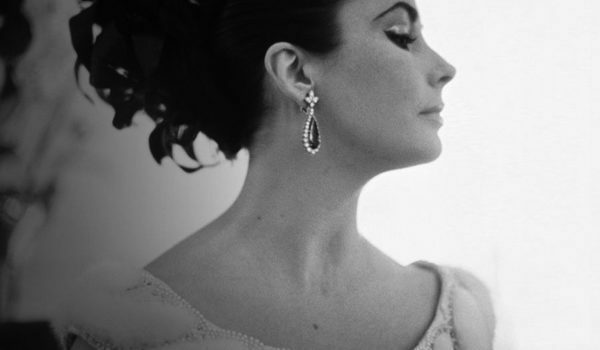 She was bigger than life in more ways than one — known for her eight marriages (twice to Richard Burton), her love of extravagant jewels, and her tempestuous movie roles. But those famous violet eyes weren’t just the ones behind Maggie in Cat on Hot Tin Roof and Martha in Who’s Afraid of Virginia Woolf?. 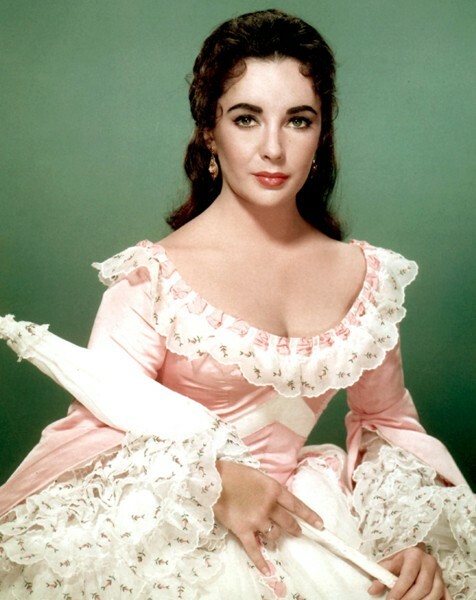 Liz — who hated to be called Liz — also starred in many historical costume movies over the years, some of which were made as big an impact as the roles that won her Oscars. 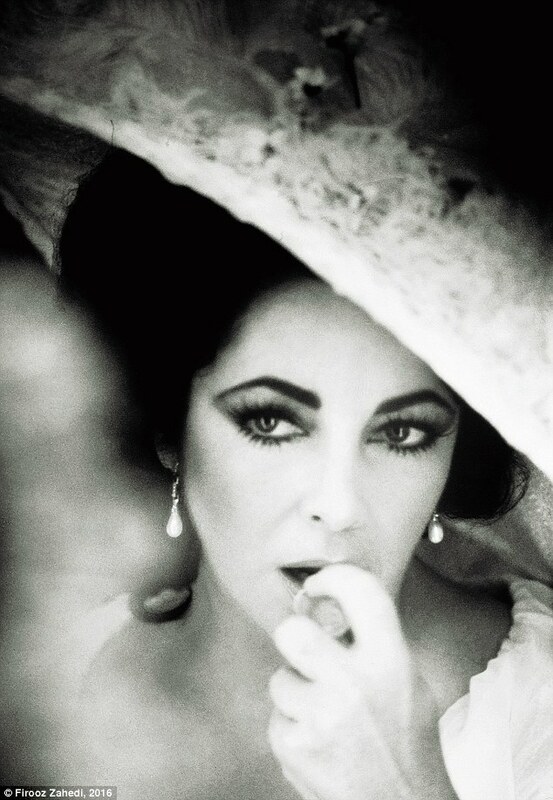 It’s time we give Elizabeth Taylor her Woman Crush Wednesday due. An uncredited but important role. Someone online has a thing for this flick. Making wimples hot in the ’50s. Kendra may have found nothing worth watching in this movie, but I’m still digging the white wig with the black eyebrows. She makes a fine Civil War-era Southern belle. See the gold lame! 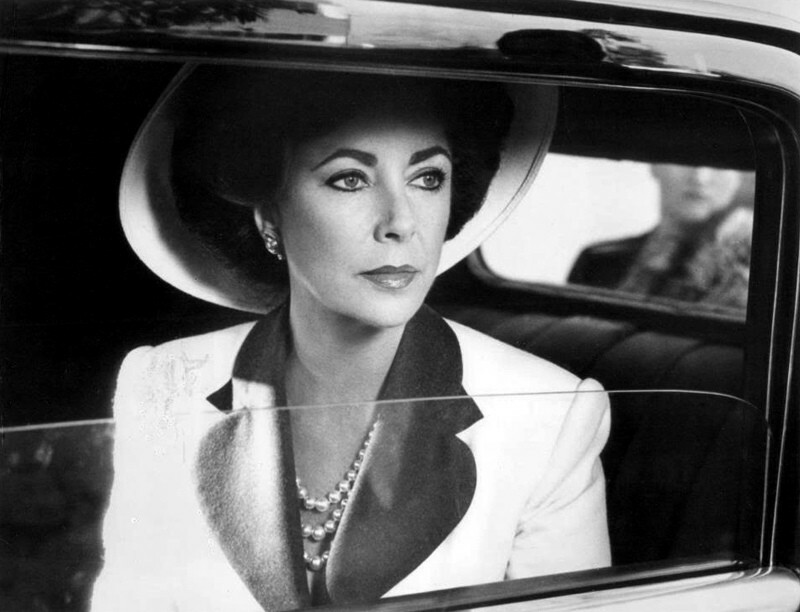 Feel the fire between Richard Burton and Elizabeth Taylor! Hear 20th-Century Fox go bankrupt! Opposite then-husband Burton, this is pretty much the hottest version of Shakespeare’s play ever. A tiny uncredited part, just so she could be on-set with Burton (who played Henry VIII) and show off some Tudor jewelry he gave her. The film was widely panned, but she still looks so good. 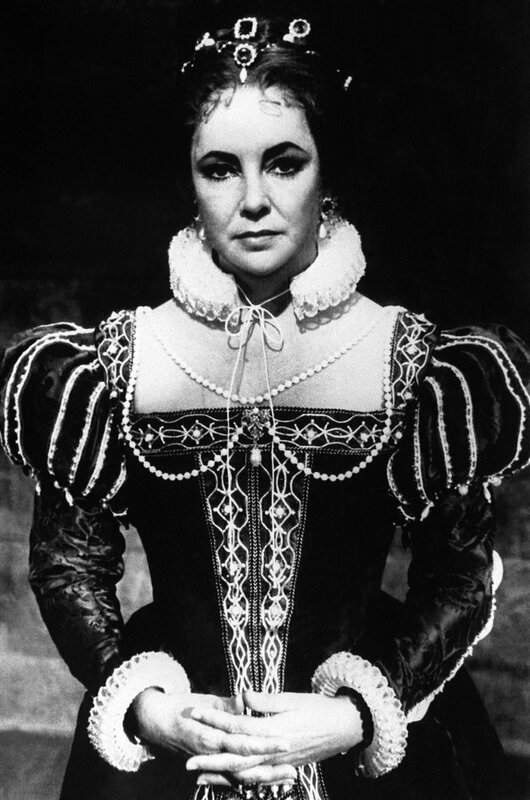 Not a historical costume movie, but she played an actress who performed a Shakespearean role, providing scenes of La Liz in Elizabethan costume. 1980s does 1940s, Taylor looks perfectly glam. Cheesy but fond memories for some of us! 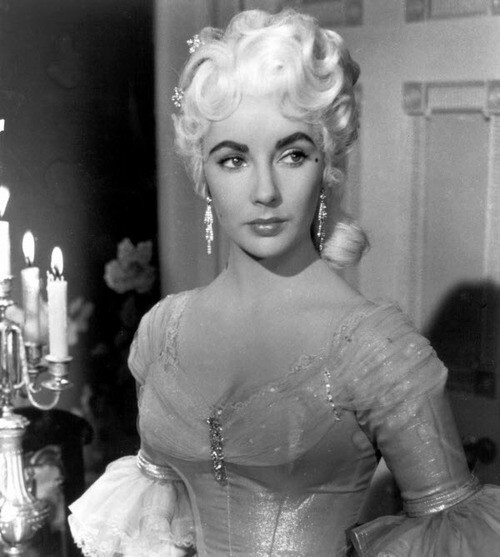 These are just a few — what’s your favorite of Elizabeth Taylor’s historical costume roles? More than anyone else, she is the mother of “I don’t care if its period, I want to show off my rack”, but I still can’t hate. Dangling in the Tudor rack is the pearl La Peregrina, once owned by Mary I (gift from Philip II of Spain). 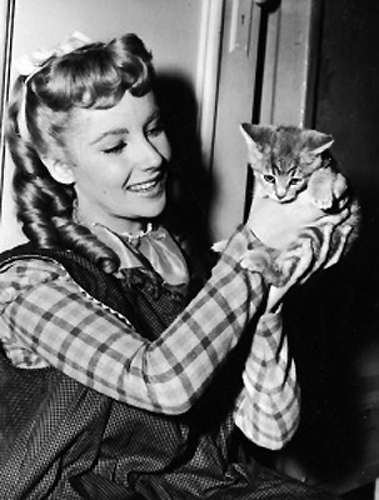 A side note, Taylor’s career could have started in 1939, when a friend of her mother told her to take her child to MGM to apply for the role of Bonnie Blue Butler in ‘Gone With The Wind’ because of her resemblance to Vivien Leigh. 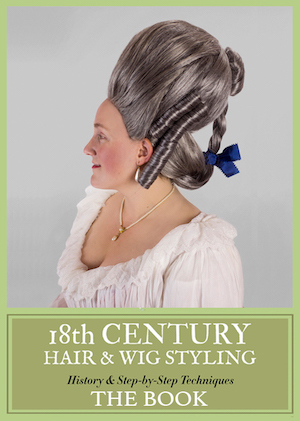 If you click the link in the caption under the Anne of the Thousand Days picture, you can read all about La Peregrina! Loved her — at least on screen. Offscreen, the two-headed monster, the Lizandick, was a bit much to take. Fortunately, she outgrew it. 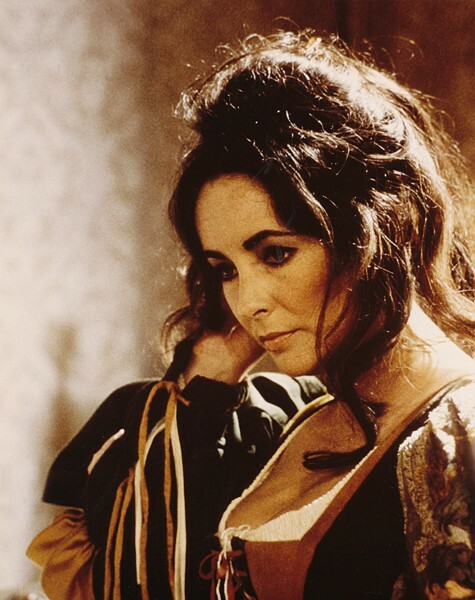 Fave role has to be Rebecca in “Ivanhoe.” I’ve always had a thing for fair skin and dark hair. I did love their fire — wouldn’t want to be near it in reality, but I admired how brutally honest their connection always seemed, onscreen & off. 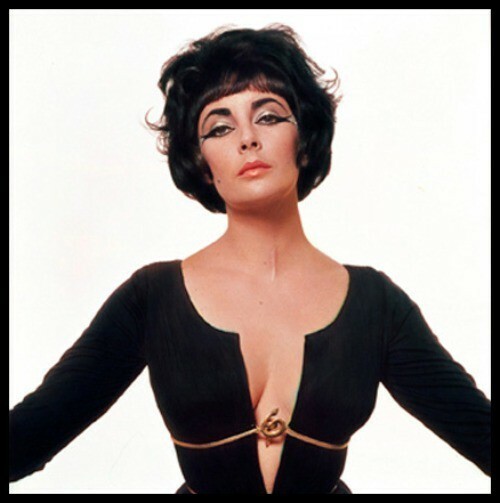 My personal favorite Liz “historical costume” movie would have to be “Cleopatra,” because if you can’t get period accuracy, go for broke and make it look like it was designed by a team of stoned drag queens. Shrew, no contest. From the same team as ’68’s Romeo and Juliet. Costumes, sets, music–all gorgeous. And it’s hilarious! 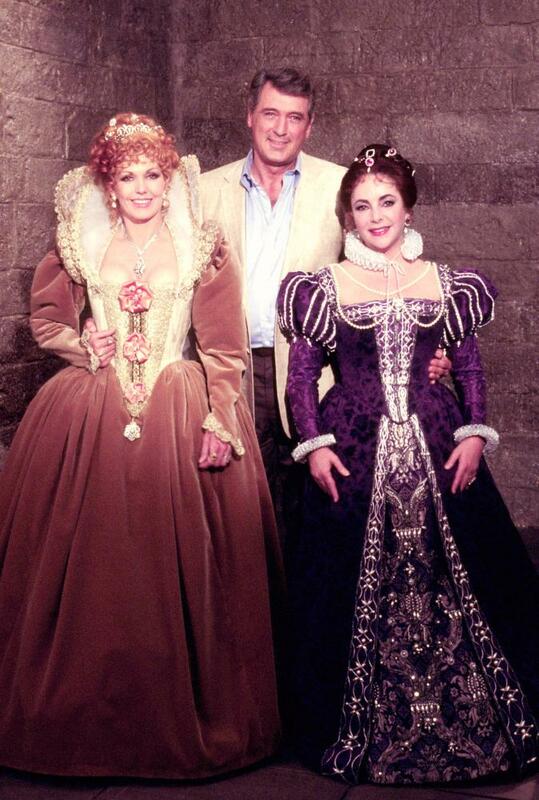 I think Elizabeth did quite well with Shakespeare, and Burton was, of course, magnificent. The “chubby Burtons” took some heat from reviewers. Yeah. We should all be fat like her. One of the greatest screen beauties. (And Howard Keel and Kathryn Grayson were pretty darn hot in the “TotS” scenes in “Kiss Me Kate”…) My favourite Howard Keel film. No, hang on, Kismet [we walked down the aisle to ‘Night of my Nights’]. No, 7 brides. Dammit. Hang on, TIGHTS in Kiss me Kate, so that wins. You forgot “GIANT”. Miss Taylor spent at least half of the movie in the 1920s and 1930s.